Few people own a vinyl record player. I don't. The culture of buying LPs, 7" and 12" singles is pretty much extinct in South Africa. Unless you're older than I am or a DJ, chances are you have no idea of what a 7" or 12" is. Don't get me wrong: I love new technology and wouuld never trade in my collection of CDs and MP3s for hoary old LPs and 8-track tapes. Yet it cannot be denied that there is something so damn... romantic about the crackle and pop of a stylus travelling in the groove, making music as if by magic. Old records were cool in other ways, too. They're huge, and therefore the space for album art is so much more. Gone are the days of the complicated psychedelia of The Rolling Stones, Led Zeppelin and The Grateful Dead sleeve art and hello to the posed portraits of Gwen Stefani and Mary J. Blige as seen on the Top 40 rack at Musica. How else? Compact discs are just that - compact - and somehow require artists to brand them with their faces. And so you can go on and on, comparing the pros and cons of vinyl vs. CDs. But there is one very special aspect of vinyl records that has been lost in the digital age. If you look at the runout groove of a record (especially if it was mastered at places like The Exchange in London or Frankford Wayne in New York) you might see a little secret message, engraved in the dead wax. Normally, this is where the person who does the mastering would have inscribed the catalogue number and other reference codes into the master disc with a stylus, but sometimes they add a personal touch (for a better understanding of how mastering a vinyl record works, read the Wikipedia article). What started as an industry inside joke soon grew into a cult phenomenon, and several websites are dedicated to cataloguing runout groove inscriptions. Even the artists themselves got in on the act and several bands requested that specific messages be inscribed on their records for their fans to discover. Here are three of the many, many vinyl records out there with interesting things written in the runout groove. Have you discovered any? Joy Division. 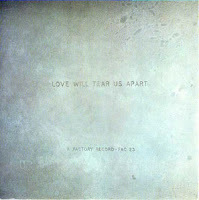 Love Will Tear Us Apart. 7" single. This is obviously meant to be read as one message - has music become the only thing of value in the author's life? Is it an eerily prophetic message from vocalist Ian Curtis himself, who would commit suicide the month after its release? Depeche Mode. Stripped. 12" single. Side A: Don't give me double messages, O.K? 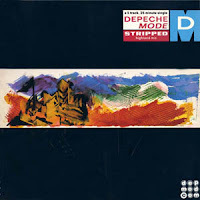 The older Depeche Mode singles are famous for crazy runout groove graffiti. The first message here is obviously a snub at another technician at the mastering plant, but does the second describe the influence of Kraftwerk's robotic electronica on the Mode's music? 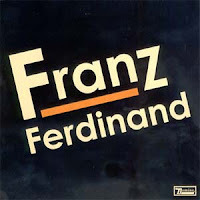 Franz Ferdinand. Franz Ferdinand. LP. Didn't expect Franz Ferdinand in this list, did you? Their singles feature inscriptions too, and much speculation has arisen among fans as to what it all means. The band seems pretty tight-lipped about it, dropping subtle hints on their website from time to time. Curiouser and curiouser. It seems like the romance of vinyl is being kept alive, after all. For the past couple of days I have been injecting purified salivary proteins of aphids into wheat leaves. Yes, folks, that's right - I'm taking a diabetic needle and sticking it into the mid-vein of a wheat leaf in order to flood it with 50µl of aphid saliva. All in the name of science. At least I'm getting paid for it (as my thesis is currently under review and I'm no longer a 'student'). I'm incubating a chitinase assay as I'm typing this, hoping to see some sort of enzyme activity. Here's hoping! On another note, I'm accompanying my sister and her two children to Gold Reef City on Good Friday along with all the other billions of people trying to avoid the Rand Easter Show. I dislike crowds, but the little dears are pining for me to go and I'd so hate to disappoint. So its riding rollercoasters and eating candy floss 'till we puke on Friday for me. What are you doing to celebrate Easter?